Is this teamup the 3DS RPG of your dreams? Fun combat system mixes strategy and reflexes; great place for RPG newbies to wet their toes; funny story; charming presentation; clever dream mechanics; great level design. RPG veterans will be infuriated with constant tutorials; overall formula isn't greatly overhauled over past installments; stunning amount of racial stereotypes that some may find offensive. Despite Mario being known as the king of the platformers in the gaming world, the portly plumber seems to appear in just as many RPG series than he does in hop and bop adventures. Between the original Super Mario RPG on Super Nintendo, the Paper Mario series, and the Mario & Luigi series, there's no shortage of options to get a little strategic with the mustachioed hero. While Mario has never starred in an RPG that was less than passable, the newest title in his RPG adventures stands side by side with almost all of them in terms of quality and fun factor. Bless its heart, Dream Team tries really hard to have a compelling story, but falls rather short in that regard. 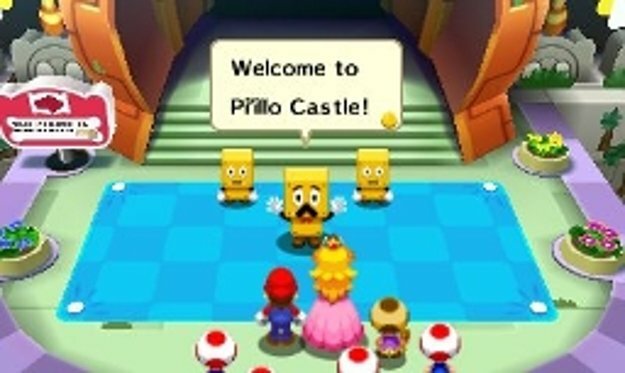 Mario, Luigi and Princess Peach are invited to visit the bizarre island of Pi'illo. Before long, you're told about an ancient villain that has entrapped island residents in stone pillows. 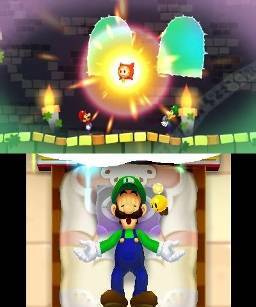 Thanks to Luigi's innate ability to fall asleep at will, these pillows (sorry, Pi'illos) allow Mario to actually enter Luigi's dreams and rescue the poor souls trapped within. 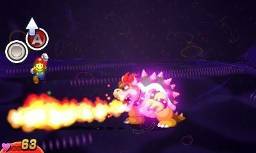 Like any decent RPG, there's more than meets the eye with the overall storyline, and of course, Princess Peach is kidnapped and Mario mainstay villain Bowser makes an appearance as well. You'll probably keep playing to see what goofy scenario and jokes the story has to yield more than any significant plot turns, but that's to be expected with a Mario title. Some may also be off-put by the blatant racial stereotypes present in the game. 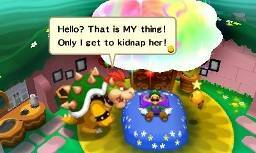 Mario and Luigi speak in hand-wringing Italian sounding gibberish, and various characters in the game are written with excessive accents with an especially blatant French character that replaces "this" with "zis". The areas to explore are fun and clever, as are the mission objectives. 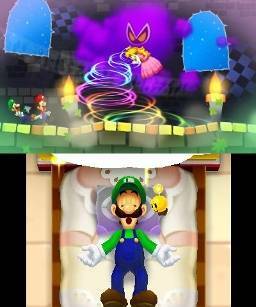 The game takes place in two main areas; the real-world of Pi'illo, and Luigi's dream world within his mind and subconscious. 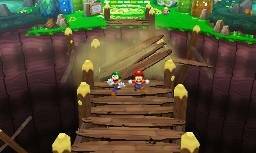 Exploring the real world will be instantly familiar to Mario and Luigi veterans. 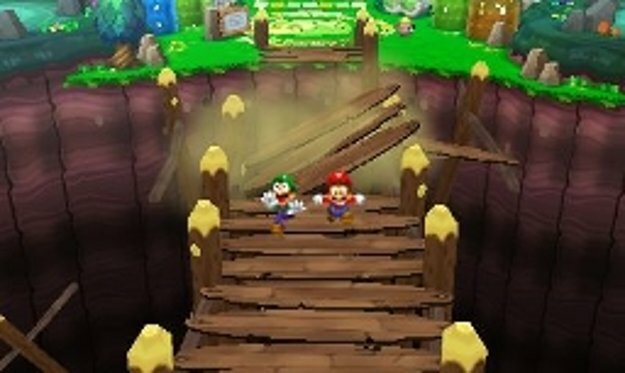 The environment is explored by a top down perspective as players control both brothers simultaneously as they jump, hammer smash, and solve puzzles from point A to point B. 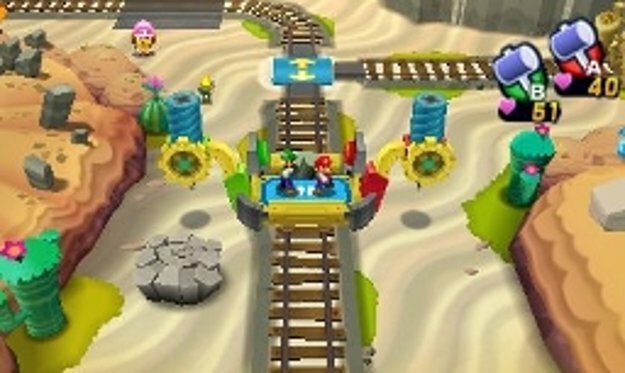 The dream world is where the game differentiates itself from other games in the series. 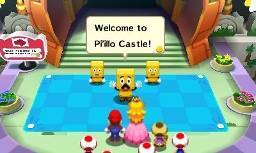 The dream world is played in a strictly 2D plane much like Super Paper Mario on the Wii. 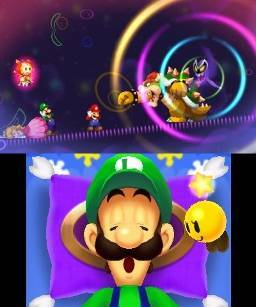 While in the dream world, the bottom touch screen on the 3DS represents Luigi's face, and playing around with the bottom screen yields all sort of neat and clever effects. 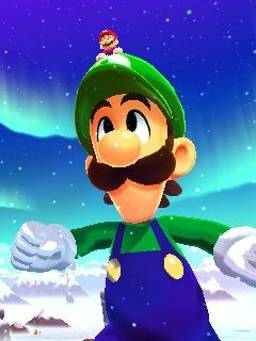 By having Luigi interact with and possess various elements in the environments, you can cause wind storms that rearrange the environment by tickling his nose, using his mustache as a catapult, or growing Luigi to 100 storeys tall or duplicating dozens of himself to bridge chasms. 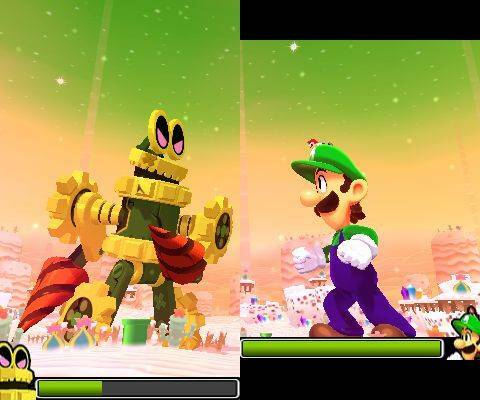 It's a neat perspective, and there's plenty of opportunities to explore the humor in Luigi's inferiority complex to his more famous brother from within his psyche. While equipping items, exploring a world, going on quests will be familiar fare to RPG fans, Dream Team's combat system is a joy to wield and keeps things fresh throughout. 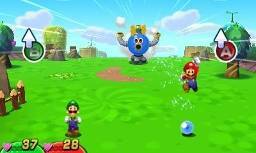 The battle system is a neat mix of real time reflexes and strategic choices that have defined the Mario and Luigi series. Whenever enemies attack the Bros, you have the opportunity to avoid it or counter attack with a well-timed jump or swing of your hammer. When it's your turn to attack, well-timed button pressess will result in more damage or extra hits on your enemies. Boss battles get even more interesting as the enemies chase you through the battlefield as you have to avoid obstacles and attacks at the same time. Some of the battles get surprisingly challenging and some attacks are pretty tough to read. In the dream world, Mario is your navigator while Luigi can clone himself to augment your damage dealt, but your number of attack opportunities are cut in half since Luigi isn't technically playable in the dream world. It all sounds more complicated than it is, and most players will adjust very quickly. Beyond normal attacks and items with passive effects, you can also unlock new attacks that involve both brothers and require the use of mana, known as Bro Points here. 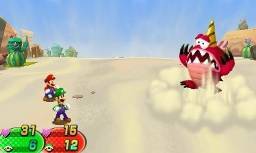 These BP attacks involve Mario rolling a giant ball of dozens of Luigis Katamari-style before kicking it into his enemies, dozens of Luigis forming a giant hammer, or even something simpler like both Bros kicking a shell between their enemies back and forth. Like everything else, pulling off these attacks effectively requires excellent timing. The game could use to have more attacks, but what is here never goes completely stale. 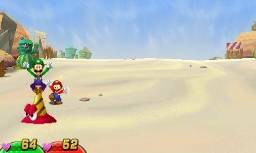 Players can also take initiative and get an extra shot in by hitting their enemies on the main field environment by jumping or hammering their enemies before entering battle. The presentation for the game is simply lovely, and fits the silly and humorous aesthetic of the game very nicely. The game is bright and colorful, and nicely animated in a stilted sort of way that is a clear throwback to 16 and 32-Bit RPGs like Chrono Trigger or Final Fantasy tactics. Like most 3DS games, the 3D effect is pretty pointless, especially in sections that require to use the tilt function of the 3DS. 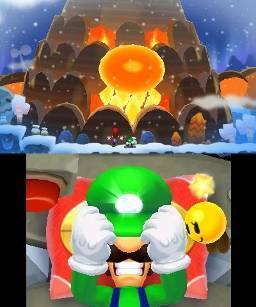 Environmental design is varied and fantastic, especially when you get into the deeper recesses of Luigi's subconscious. Racially insensitive Italian gobbledegook aside, the sound effects are charming and nostalgic. 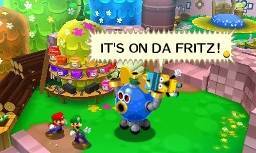 The music is fun and catchy too, even if it isn't the most memorable soundtrack in the gaming world. If you're young, or just a young-at-heart nostalgic that grew up with RPGs when they were still coming into their own in the '90s and early 2000's, you'll find tons to enjoy with this title. What few missteps the game takes are phenomenally eclipsed by a great sense of joy, silliness, clever gameplay, and sheer imagination. Those looking for an addictive and lighthearted quest that stretches into dozens of hours will find lots of love here. It may very well be the 3DS adventure of your dreams. The primary platform in which our evaluation was conducted for the basis of this review is the Nintendo 3DS version of the game.